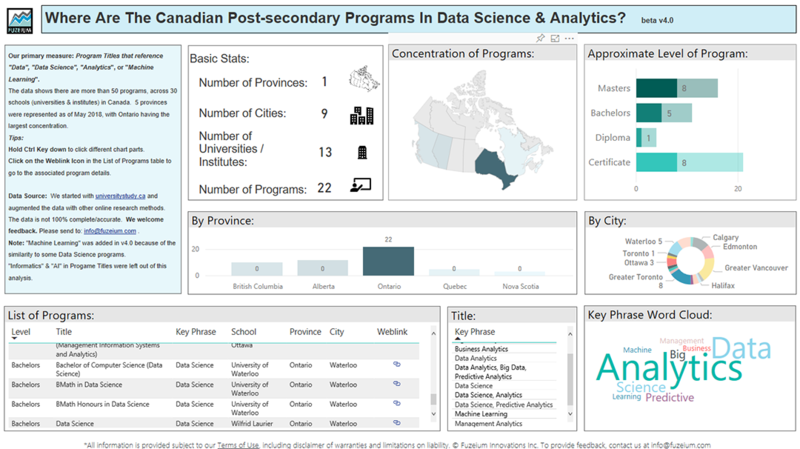 Where are the Canadian post-secondary programs in data science & analytics? There is a need for prospective students, academic institutions and employers to see an integrated picture. Too often, dashboard/report visuals are displayed indiscriminately and the intended meaning is lost. To address this problem, Fuzeium gives its reports/dashboards proper context. This is achieved in part by stating the underlying question and providing a basic explanation. As the user interacts, new questions and answers arise. 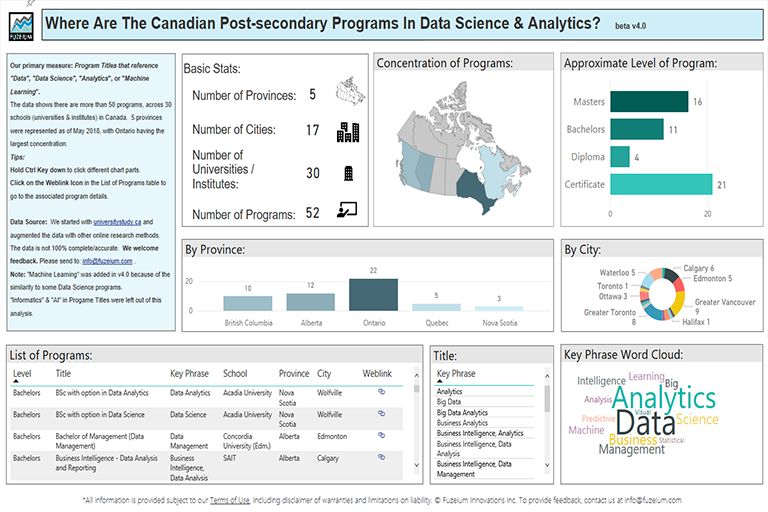 In this showcase, we felt it necessary to address the lack of centralized information about post-secondary programs available in Canada related to data science and analytics. We amalgamated data from various sources, and then counted the program names with "Data", "Data Science", "Analytics" or "Machine Learning". The program name count became the primary measure for the report. 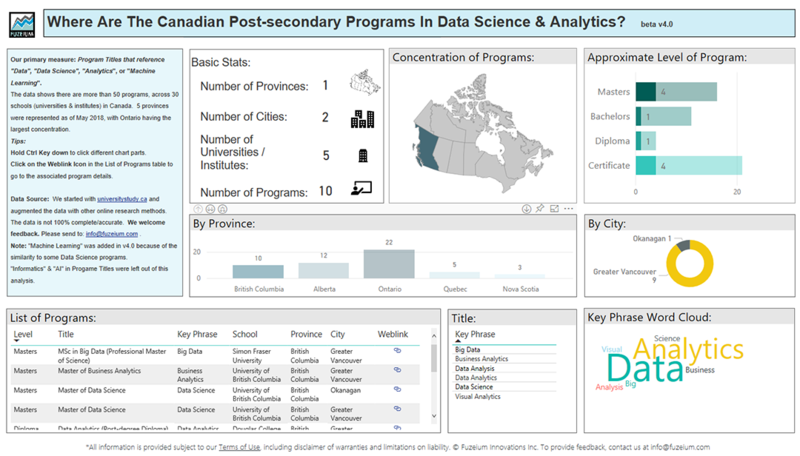 To better understand where the programs are in Canada, categories were applied, such as province, city, and university. To aid in the exploration of the data, program title words generated a word cloud (to suggest themes) and a bar chart indicates academic levels. An interesting insight emerged: the provinces of British Columbia and Ontario had the largest number of Masters degrees in the measured subjects. This measure "may" suggest a higher degree of tech ecosystem maturity, than some other jurisdictions. Evidently, this finding corresponds to Amazon's recent interest in Canada: 1) Toronto, Ontario is on the shortlist for cities suitable for Amazon's second headquarters in North America, and 2) Vancouver, British Columbia, will be the recipient of about 3,000 new jobs. 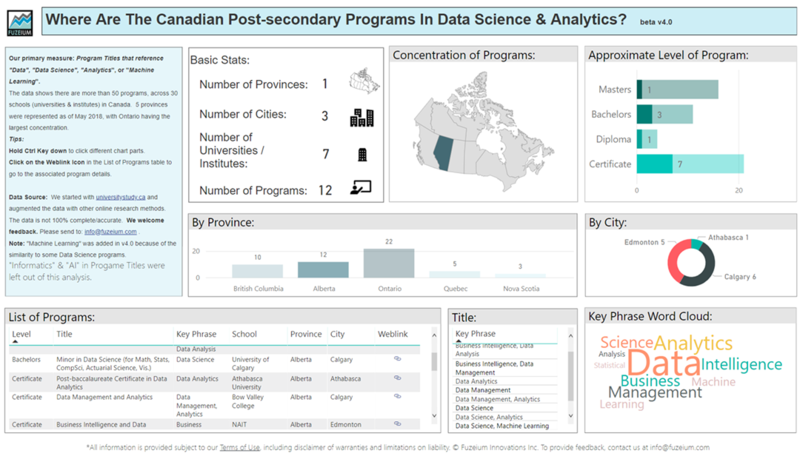 By clicking on the different provinces represented you can see how the Academic Level profile changes. Alberta, for instance, has 1 degree in the measured subject. 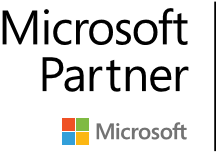 A detailed list is provided to allow the user to click through to the corresponding program web site for more details.